David Warnock’s mayoral campaign invited me to join Mr. Warnock on the campaign trail as part of his Baltimore City Turnaround Tour. 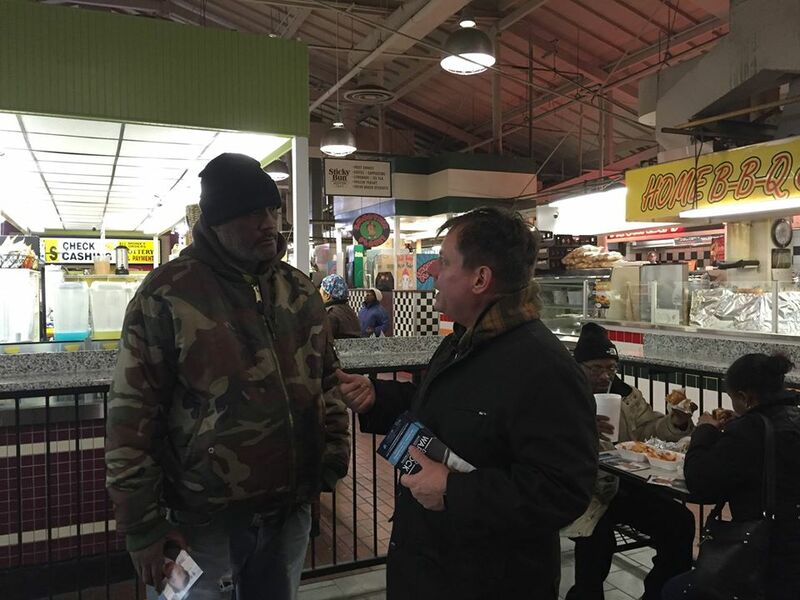 I joined Warnock yesterday (Saturday, Feb. 13) at Northeast Market for some good-ol fashioned retail politicking. I captured video of Warnock interacting with Baltimore City residents and I had the opportunity to interview Warnock briefly about his mayoral platform. Warnock said yesterday that he views the mayor’s job “as the culmination of his life’s work.” A universally accepted axiom in Baltimore City: Warnock’s business record is stellar, and he’s one of the brightest business minds in Maryland. Some of Warnock’s mayoral priorities include continuing to build his workforce development program, expand the community school concept (Warnock was one of the founders of the Green Street Academy, a public charter school located in West Baltimore) and untangle the city’s massive bureaucracy. If Warnock is elected, his goal, he said, is to audit city government. I switched directions to Freddie Gray. “Freddie Gray was a Baltimore story. The legacy of Freddie Gray, if nothing else, is that the world is watching Baltimore,” Warnock said. “We’ll have another uprising if we can’t put people to work. Freddie Gray was a Baltimore story because he couldn’t find a job; he had lead paint poisoning; he had a poor education. All of those things put him in a bad place. We need to charge the arc of the Freddie Gray’s out there,” Warnock said, emphatically. Yesterday was the first I met Warnock for a one-on-one interview. It’s rare I would ever admit to being thoroughly impressed with someone seeking a public office; nevertheless, Warnock is the exception. I noticed immediately a disarming warmth and sincere authenticity about Warnock. He’s a down-to-earth guy with a serious plan and vision to reshape Baltimore. I have a sense that he would like to fundamentally transform the city’s image. I haven’t met too many political candidates with retail ability. But again, Warnock is the exception. He’s not the sort of fly-by-candidate we’re used to seeing stop off in an African-American neighborhood. You know the type: a candidate who smiles large and promises too much, but inevitably fails to deliver. No, David Warnock is a man of action; he places politics on the back burner. Driving Warnock’s passion for mayor: solutions – real solutions that will put people back to work, improve the criminal justice system and fix broken city schools. I sense an utter fearlessness about Warnock. He appears to be relentlessly unafraid to address serious issues in a city he has called home for over thirty years. Baltimore City residents are craving leadership. City residents are tired of stale politicians and political has-beens. City residents are demanding ideas from its candidates, and Warnock is leading the pack in providing policy prescriptions for a city that has a few aches and pains. Baltimore City requires a mayor who is real. Residents desire someone genuine. City residents covet someone who is tested and ready to go on day 1 – somebody with a servant’s heart. City Hall experience: need not apply. Warnock has an insider’s heart, but an outsider’s perspective. Come April 26, Baltimore City has an opportunity to stand at the crossroads between the past and present. Residents of the city can choose vision, experience and leadership over political agendas and false promises. Baltimore can choose David Warnock. Rarely do political candidates seamlessly win me over. But once again, David Warnock is the exception.